In 815 I was demoted from the Capital to a local Officer of Jiujiang Prefecture. 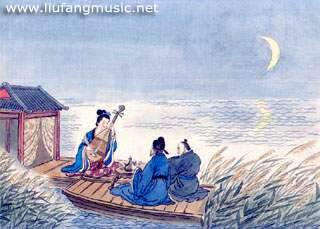 One autumn night of the following year, while seeing off friends on a boat leaving Penpu harbor on the Yangtze River, I suddenly heard a pipa tune being played from the neighboring boat. The music style was clearly from the capital. Being totally surprised, I made an inquiry and learned that the musician was a lady who used to be a famous star in the Capital. She studied the pipa with the great Masters Mu and Cao. Then her glorious years past with the time as her beauty faded. Finally she had to lower herself to marry to a merchant. I then invited her to my boat, had the table re-set, and asked her to perform for my friends and myself. When the concert ended, I asked her why she was so sad. She told me of her splendid youth and how she lost her fame and lived a life of a merchant¡¯s wife. I had not myself felt depressed since my own departure from the capital. But after I heard her story, that night, the reality of my own demotion sank in. And I could not help but write for her this "Pipa Song", a long poem of six hundred and sixteen characters. I bade farewell to my friends on a boat. I, the host, dismounted and the guests went aboard. Seeing my friends off while the moonlight bathing in the river. My guests forgot to leave and I knew not where we were. Tracing the sound, we looked for the wonder maker. The music stopped and there was no sound to hear. Here to drink at our feast replenished by lamplight. With half her face hiding behind the pipa still. Her music flew out even before playing a note. Pouring out the resentment of her life. Telling from her heart the life story long. The fine strings hummed like lovers' whispers. As pearls, large and small, on a jade plate fall. The spring frozen, the strings ceased vibration. The water stopped flowing and silence set in. At this magical moment, silence tells more than sound. Or horsemen riding among a forest of spears. As if the silk curtains were ripped with great force. The music came to an end with a crystal snap. Only the Autumn moon shining in the rever so pale. And lived in the famous district of Xiamoling . Her beauty the envy of all pretty girls. For every song she received endless bolts of silk. She danced till her head gear fell to the floor. Her best years slipped away. Then her brother joined the army, and her aunt died. Times changed, and her beauty faded. Till finally she had to lower herself marry a tea dealer . No company but the cold water and the moon. Awake from Crying, her face wet with tears. But now, having heard her story, sadness doubled. Does it matter that we've just met, if our hearts understand? And now, a sick exile at JiuJiang, my sorrow grows. No flute, no pipa, all the year long. Choked with reeds and bamboo. What do I hear, day and night? The sad songs of cuckoos, the sad cries of apes. Often-I sit up, alone, and sip wine. But they are so crude and they grate on my ears. Tonight I heard you play the pipa. It brightens me like music from Heaven. And in turn I will write you a "Pipa Song". Grief-filled and heart-felt she played a different tune. Tear-soaked, sorrow-laden, all sobbed out at once. And who was weeping the bitterest tears of all? whose blue gown was soaked in tears. Bai Juyi (772-846 AD) is one of the greatest poets in Chinese history. His fame in China is comparable to that of Shakespear in the English speaking world. Xiamoling - red-light district in Changan (now Xi'an), the Capital of Tang Dynasty. In the traditional China, classes in the society are very big spelled. Scholars and learned people were highly respected, and the officials were selected from learned people through strict examinations based on the knowledge about the Chinese classics, literature and poetry. The "businessmen" or the merchants were regarded among the lowest in society, as these were synonyms for "greedy", "selfish" and therefore "low morality" (which is not necessarily true from today's standard). The reason was that "businessmen only looks for profits in term of money", (although the history taught that the "greediness" for political powers may be even more harmful to the society). Translating poetry is difficult; translating Chinese poetry into any other languages is particularly difficult, because the root of Chinese language is the characters that are symbolic images (not real pictures, but meaningful pictures), whereas all western languages are phonetic notes. The meaning of all western languages is transmitted by sounds only, but that of Chinese is by both images and sounds. Even the sounds have various tonalities, when weaved in the verse, creating a musical and rhythmic feeling that is totally lost in any translation, not to speak of the images that come with the characters. The original verses of the above poem are very beautiful in all aspects. In this translation, only the story is kept, thus it can hardly be regarded as poem in terms of rhythm and meaning. Readers are warmly welcome to give us advice and suggestions[click contact] for improvement.